What makes Palm Beach a unique affordable luxury travel destination? Balmy ocean breezes, world class shopping, fine dining galore, interesting people watching, exclusive hotels and a European village vibe are just some of the characteristics that make Palm Beach such a desirable travel destination. Since the early 1900's this tropical paradise has been the winter destination for America's East coast elite. Henry Flagler, the visionary developer, set the tone for this fabled spot with the building of the legendary Royal Poincianna Hotel and his opulent mega-mansion. For the last one hundred years, this sixteen-mile long island has been one of America's top destinations for the rich and famous. With this cache brings the best of everything, making Palm Beach the perfect place for a four-day solo retreat. I've visited Palm Beach every April for the last five years, each trip a few days long. These repeated trips have allowed me to dig deep into what is so special about this place. Palm beach has a certain sense of style, friendly and interesting people, a non-touristy flavor, is easy to navigate, is full of lush tropical landscaping, and, in my opinion, is one of the safest places in America. Palm Beach is easy to get to with numerous major airlines flying into West Palm Beach International Airport. I usually fly Southwest, which has some of the best super saver airline fares starting at around $200 round trip from New Orleans (I typically arrive on a Thursday and leave the following Monday). With its famed Leopard Lounge, courtyard dining, luxurious interiors and its quiet, secluded pool area, the chic Chesterfield Hotel (which you can book here) is where I love to stay. It's within easy walking distance to Worth Avenue as well as the many one-of-a-kind boutiques and galleries, the beach and all of the fabulous dining choices Palm Beach has to offer. Rates in the off-season start at $185 per night. My arrival is most often sometime after noon. Once I have checked in and unpacked, I head to the pool for a swim and a refreshing cocktail. 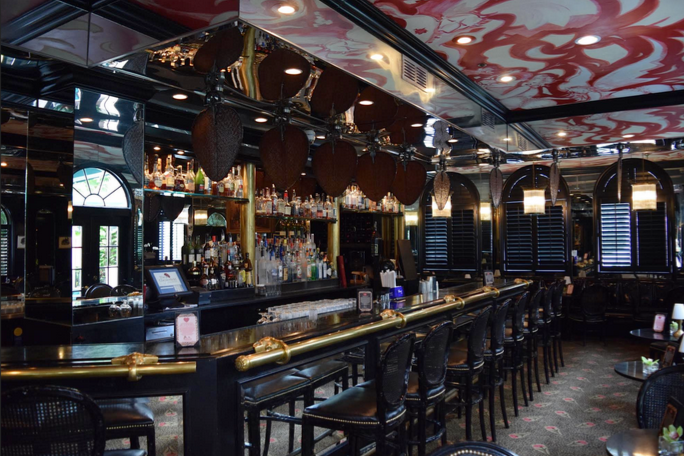 In the evening I either go to a performance at the Kravis Center for the Performing Arts or I spend a few hours having dinner and drinks in the elegant Leopard Lounge, a famous Palm Beach watering hole. One of the ways I judge if a hotel is solo friendly is whether the bar is comfortable for a solo traveler to have a glass of wine or two and not feel awkward. I love to people watch, write in my journal, let my thoughts wander or just enjoy being alive in this beautiful setting with wonderful live entertainment. The hotel's staff treat solo travelers with kid gloves. The Leopard Lounge's atmosphere does not lend itself to unwanted intrusions by strangers. It's a wonderful place to relax after a day of fun. I'm up early and I like to walk several blocks to the Surf Side Diner on South County Road for a tasty organic breakfast of eggs over medium easy, salad, wheat toast and strong coffee. Solos, couples and families frequent this popular breakfast place with a classic, casual and laid-back diner atmosphere. Next, I head to Worth Avenue for a day of mostly window shopping and to eat at my favorite lunch spot, Taboo, a Palm Beach staple for the last eighty years. Legend has it that the Bloody Mary cocktail was created here. Gucci, Valentino, Giorgio Armani, Graff, Tiffany, Cartier, Hermes and Neiman Marcus are a few of the high end shopping venues offered on this world renowned shopping street. Except for Rodeo Drive in Beverly Hills, there is no other four block street that has this many upscale shopping options in America. "Eye candy galore" is how I describe what you will see when you saunter down the Avenue. After an exhilarating and exhausting day on this iconic street, I head to the sophisticated and sedated 264 Grill for dinner, which is only a five minute walk from Worth Ave. My favorite item on their menu is Key Lime Pie, it's the best I have ever tasted anywhere in the world. *Update: 264 Grill is no longer open for business. Try out one of these restaurants instead. Nick and Johnnie's is my breakfast locale of the day. I return here every year for breakfast or lunch because the menu is divine. On my last visit, my fabulous meal consisted of fresh salmon on avocado toast with bean sprouts, freshly squeezed Florida orange juice and extra strong coffee. I can honestly say I have never had a more delicious breakfast. My Saturday mornings are usually saved for some type of cultural activity. On my last trip I visited the Flagler Museum for the first time. This beautifully preserved historic mansion is a must see on any trip to Palm Beach. The opulent interiors are exquisite and the scale of this mansion's grandeur make it hard to believe it was built in the early 1900's. Also, you can view Henry Flagler's personal rail car which is also interesting. For lunch this last visit, I tried Bricktops, a new favorite dining spot on County Road. Delicious and light cuisine is what you'll experience eating here. Next, I venture out to do some more shopping, this time I'm ready to open my wallet. On County Road and in the small streets off of Worth Avenue you will find some of the best specialty, vintage and consignment shops in America. I start at Via Testa behind Nick and Johnnie's restaurant off of Royal Poincianna Way. There you will find two of the best vintage/consignment shops in America, Paradise Lost (now located on Sunrise Ave) and Cassie and James owned by Susan Hoffman Yespy, consignment proprietor extraordinaire. A few blocks away is The Church Mouse, a consignment shop sponsored by the Episcopal church, that has everything; clothes, accessories, jewelry, original art, books, furniture, home accessories, etc. This vintage hot spot is where a lot of Palm Beach spring cleaning, de-cluttering and estate sale merchandise ends up. All proceeds from the sales go to charity. The quality and the price points of the merchandise are wonderful. Unworn clothes with the tags, never read books, oriental rugs in pristine condition, high end furniture and home accessories plus fabulous costume jewelry can be found here. The old and young, rich and famous all patronize The Church Mouse. For dinner I would recommend Via Flora, a stylish, new restaurant in Via Guccia off of Worth Ave. On my last visit it was early evening when I ate outside in the beautiful bougainvillea and hibiscus flowered courtyard where I settled for a tasty salad, a glass of wine for dinner and freshly made pistachio ice cream and coffee for desert. I loved my light meal and loved watching the fashionable Palm Beach residents dine with their dogs. Via Flora is another great solo friendly dining option in the area. After dinner, I'll either walk down Worth Ave. to the beach and watch the sunset or head back to The Chesterfield Hotel for a night swim or a glass of wine or two, once again, in the happening Leopard Lounge. My breakfast is taken in bed with a pot of strong coffee and two pieces of wheat toast. I like to save my appetite and calories for Sunday Brunch at The Breakers, one of America's finest resorts. The legendary Breakers Hotel is so over-the-top luxurious; it's really a destination unto itself. Palm Beach has some of the most beautiful architecture in America. An overlooked architectural building type is PB's beautiful churches. Bethesda-by-the-Sea is one of its most stunning and historical examples. On my last visit I attended the late morning service and took a guided tour afterwards. Along with the magnificent exterior, the interiors and the church gardens were inspiring. Many opulent weddings have taken place here. I thoroughly enjoyed the tour and lingering in the many garden spaces. After lunch at the Breakers, I headed back to the Chesterfield Hotel and walked to the beach for the remainder of my leisurely Sunday. One of Palm Beach's hip spots, Buccan, was my restaurant selection for my final dinner. Casual, cool with communal tables makes this another perfect dining place for solo travelers. Small plates, choice wines and specialty drinks, creative entrees and sinful desserts is what you will experience at this trendy eatery. I'll have a light breakfast at the hotel or I'll walk to the Brazilian Court for a change of venue. I typically do some last minute shopping before I leave. One of my shopping habits is to look a lot before I decide to buy something. On the day of my departure, if I really want to purchase something I have refrained from buying and I haven't already blown my shopping budget, I will run and pick it up. Before I left for Boca Raton on my last trip, I had a fabulous Thai Shrimp salad as my farewell meal in the Chesterfield Hotel's courtyard dining area, loved eating and lingering there before I left. Palm Beach has been described as a "little bit of paradise." Exclusivity, safety, walkability, fabulous shopping, galleries, dining options and hotels are what you will experience on this special island. Once you've visited this tropical paradise you will be hooked and want to return again and again to soak in it's luxurious ambiance. Palm Beach has a special energy, a little magic in the air; it's the perfect place for a four-day solo getaway. If you enjoyed this post, let us know in the comments below and share with someone who you think might enjoy it as well. Follow us on social media for more affordable luxury solo travel tips, tricks, stories and advice. Click on the links below! In preparation for the launch of this website, I decided to look back at some of my favorite moments spent traveling alone in 2015 on my Solo Miami to Maine Road Trip. Here are four of my favorite stops. Looking for a chic, casual dining spot in The Hamptons? Pierre’s in Bridgehampton is a solo traveler foodie’s bucket list destination. There is simply no place like Pierre's.